I believe I coined the term ‘decision facilitation,’ at least in its present incarnation. When I developed Buying Facilitation™ in the early 90’s, I defined it as a ‘decision facilitation model used to neutrally (without bias) lead change through the appropriate avenues and levels of buy-in while avoiding disruption.’ When I look at that vintage definition, I realize it wasn’t as clear as it might have been. I have since learned a lot about how to explain it far better, specifically in terms of systems and how systems change. Now that the term has become part of our vocabulary, I’m pleased. Now that people are interested, I’d like to offer my newer definition and explain how I originally conceived of the term. I begin with the belief that no decisions to change can happen until the underlying system of beliefs, relationships, and rules (the status quo) buys in to making a change. In my definition, decision facilitation is a neutral navigation model that teaches people how to recognize and manage, throughout the system, all of the internal criteria they must first address, so they can get buy-in to change from all appropriate sectors, and maintain integrity through change. It’s much like a GPS system that leads a driver to their destination without bias regarding the destination. In other words, before a new decision can be made – all decisions are change management issues – the system must recognize how the Identified Problem got created, how it maintains itself, and how, or if, things around it would have to agree to change in order to resolve the problem. So buyers won’t buy a team building course unless all of the team members and managers agree to resolve their issues and have ongoing coaching or support to maintain the change. People who are overweight will not know how to listen to information about a gym unless they have decided to become healthy,eat healthy, work out, change food choices, etc. It’s never so simple as finding a need and placing a solution. Buy-in is the key, and an outside person or idea cannot understand or influence how the inside changes. Through decision facilitation, they can discover for themselves, and make the appropriate changes – all of which must happen before any solution gets ‘bought’. 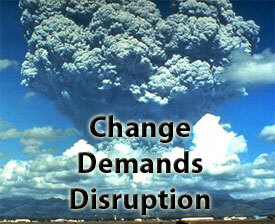 In leadership, sales, coaching – any type of change management or influencing – change is required. But real change requires disruption – disruption that creates reactions and resistance aimed at maintaining the status quo of the existing system (the culture, the environment). When change agents attempt to add to, or subtract from, the system will go to great lengths to maintain the status quo, hence limiting or delaying change and avoid change until then. In other words, as outsiders, no matter how necessary, important, or valid our solutions, if the person or group can’t make the appropriate internal changes to reduce disruption, they will do nothing. And as outsiders, we can’t help them. Because the leadership, sales, and coaching models ultimately focus on bringing in the information for a new solution without providing a route to help the insiders shift the status quo and get agreement, the system goes into ‘defend’ mode and becomes resistive. Since we all operate in systems, and systems are unique and will maintain homeostasis at all costs, change instigated from outside the system (regardless of the efficacy of the change or information) will always be rejected. In my opinion, that makes the current models inadequate. With the Buying Facilitation™ method, I’ve developed a decision facilitation system that takes the interaction out of the solution-placement arena at first, and uses a neutral navigator approach based on systems thinking to create change from the inside out. One of the problems we all have, whether facilitating others’ decisions in coaching, or sales, or leadership, is that we often attempt to bias the outcome of the decision by using leading questions (“Don’t you think you may want to consider X?”) or posing questions that will focus in one direction (“Why are you only doing X when you could also be doing Y?”). Unfortunately, because we have had only conventional questions to use (I’ve developed Facilitative Questions that manage this), we unwittingly lead the decision where we would like it to go, thus ignoring the unique and often unconscious issues that need to be addressed, and inadvertently causing the system to resist the change. I believe we can truly facilitate decision making as a precursor to change, and help others find their route with minimum bias. To do that, the decision facilitator would lead folks to enlist buy-in from the appropriate people, discover historic and possibly unconscious assumptions and actions, and to their ability to come to an agreement that would recognize and incorporate the underlying criteria (values and beliefs) that created the status quo. In other words, any change would have to incorporate the values of the system. In sales, sellers can use decision facilitation to neutrally lead buyers through all of their behind-the-scenes, unconscious, decision issues, issues that are so complex and endemic to the underlying system that buyers (not to mention sellers) can’t even understand at first. Not decision issues around a solution, or a problem, or a need. But decision issues around change, around ensuring that departments can work together, and that users will be included, and that the tech team will survive after the change. It includes historic decisions that need to be reconfigured so anything new can have a place to fit. It includes relationship issues and old vendor issues. And, these decisions must be made BEFORE a buyer begins the adoption of a solution, or the system won’t even entertain the notion of a purchase. That’s why I coined my term Buying Facilitation™: it’s about first facilitating all of the decisions that occur idiosyncratically, within the buyer’s system, that ultimately must be included before they can consider buying. I am very pleased that there is now broad usage of ‘decision facilitation’ and that a dialogue has begun about how to truly facilitate decisions. I believe it is time for us to take on a more spiritual, values-based role as sellers, leaders, and coaches: truly facilitate our customers and clients in making their very best decisions and ensure that as they change, they maintain the integrity of their values.